MONTREAL, Quebec, Canada, April 21, 2014 (ENS) – A Guinness World Record attempt to assemble the “largest parade of electric vehicles” was attended by 431 vehicles in Montreal on Friday, a much larger gathering than the previous world record parade of 305 cars set in Zurich last July. Purely electric vehicles and plug-in hybrids, electric trucks and electric motorcycles assembled at the Gilles Villeneuve Racetrack on the Île Sainte-Hélène, along the Saint Laurence River in Montreal, just south of the Jacques Cartier Bridge. It was part of Get Connected Day, or Journée Branchez-Vous, the third annual event celebrating electric vehicles organized by Le Centre national du transport avancé (CNTA), which translates as the National Center of Advanced Transportation. The record-breaking electric vehicle parade is not yet officially recognized by the Guinness organization, but it has been submitted by the CNTA. “The electrification of transportation in Quebec is now running, and this gathering clearly demonstrates that this is not a marginal movement, but rather a change in the perception of the face of transportation in Quebec,” car expert Jacques Duval told the assembled drivers and other electric vehicle enthusiasts. The hundreds of Nissan LEAFs, Tesla Roadsters, Mitsubishi iMievs, Ford Focuses and Chevrolet Volts that gathered for the parade were joined by a Bolloré BlueCar from the Paris car sharing service Paris AutoLib, and a Porsche that had been converted to electricity. The passion for electric transportation ran high among participants, many of whom expressed their pleasure in seeing so many electric cars in one place and one time. Some said they have often felt isolated, finding just one “electromobiliste” from time to time on the province’s roads. Two Parti Québécois politicians attended the parade to lend their support to the electric vehicle community. Former Minister of Natural Resources Martine Ouellet and former Environment Minister Daniel Breton were present at this record attempt and took the opportunity to acknowledge the work of transport electrification that was done by the Parti Québécois government in the 18 months from September 2012 through April 7, 2014, when a Liberal government was elected. Breton said that he intends to continue to dedicate his career to pursuing this social project, an announcement which was warmly applauded by the crowd. “This was the quietest parade of the century,” said CNTA in a statement. The popular belief has been that electric vehicles are not practical under the province’s cold climate and long distances. But now there are more than 2,800 electric vehicles already on the roads across the province. 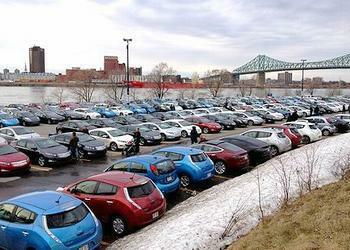 Quebecois electric vehicle owners gathered in Montreal for Journée Branchez-Vous to demonstrate that EVs are a viable and interesting option, the organizers said. Recharging can be done on a regular household outlet, so the purchase and installation of a residential EV charging station is optional. Yet the network of public charging terminals in Quebec grows day by day. With more than 250 charging stations installed in 57 cities across Quebec, the utility Hydro-Quebec says its Electric Circuit allows EV drivers to travel worry-free. On Saturday, the public was invited to explore choices for sustainable mobility at the Gilles Villeneuve racetrack where many of the electric cars from the parade were on view. CNTA is already planning another electric vehicle parade for next year’s Journée Branchez-Vous.